This archive holds all posts form February 10, 2014. 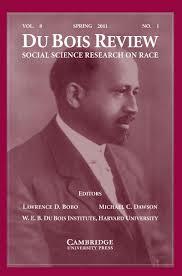 As part of our research focus on Mondays here at the RR blog, today we highlight the work of the good folks at the Du Bois Review. Given some of the shoddy journalism of late which has revealed the appalling lack of knowledge about intersectionality, the folks at the Du Bois Review are on it with a new special issue. This special issue, Intersectionality: Challenging Theory, Reframing Politics, and Transforming Movements (Issue 10.2), is guest edited by Devon W. Carbado, Kimberlé Williams Crenshaw, Vickie M. Mays, and Barbara Tomlinson. The volume reflects upon the genesis of the phenomenon, engages some of the debates about its scope and theoretical capacity, marks some of its disciplinary and global travels, and explores the future trajectory of the theory. Including academics from across the disciplines and from outside of the United States, this issue seeks to both map and understand how intersectionality has moved. Some of the pieces in the issue are open access for a limited time (until 2/17/14). For the rest, you’ll need a university login or pay an access fee directly to Cambridge Journals. Roberts and Jesudason. Movement Intersectionality: The Case of Race, Gender, Disability, and Genetic Technologies. Artiles. Untangling the Racialization of Disabilities: An Intersectionality Critique Across Disability Models. Clarke and McCall. Intersectionality and Social Explanation in Social Science Research. Goff and Kahn. How Psychological Science Impedes Intersectional Thinking. Cho. Post-Intersectionality: The Curious Reception of Intersectionality in Legal Scholarship. Bilge. Intersectionality Undone: Saving Intersectionality from Feminist Intersectionality Studies. Robinson. The Properties of Citizens: A Caribbean Grammar of Conjugal Categories. Harris. Lessons Still Unlearned: The Continuing Sounds of Silence. Carbado and Gulati. The Intersectional Fifth Black Woman.